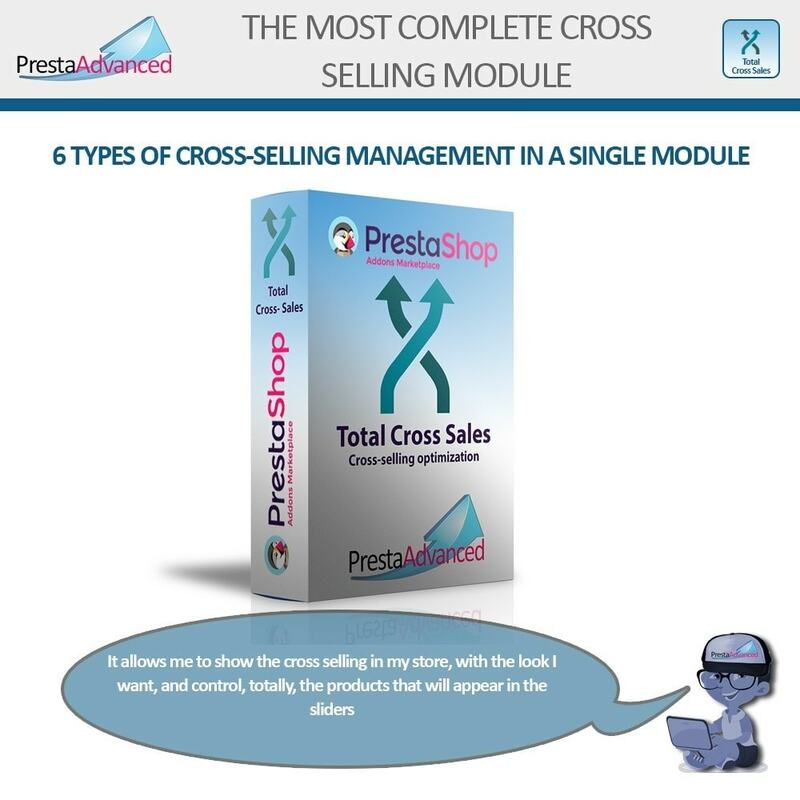 Total Cross Sales is the instrument to carry out the cross-selling of products more efficiently and with greater use of the commercial potential of PrestaShop stores. 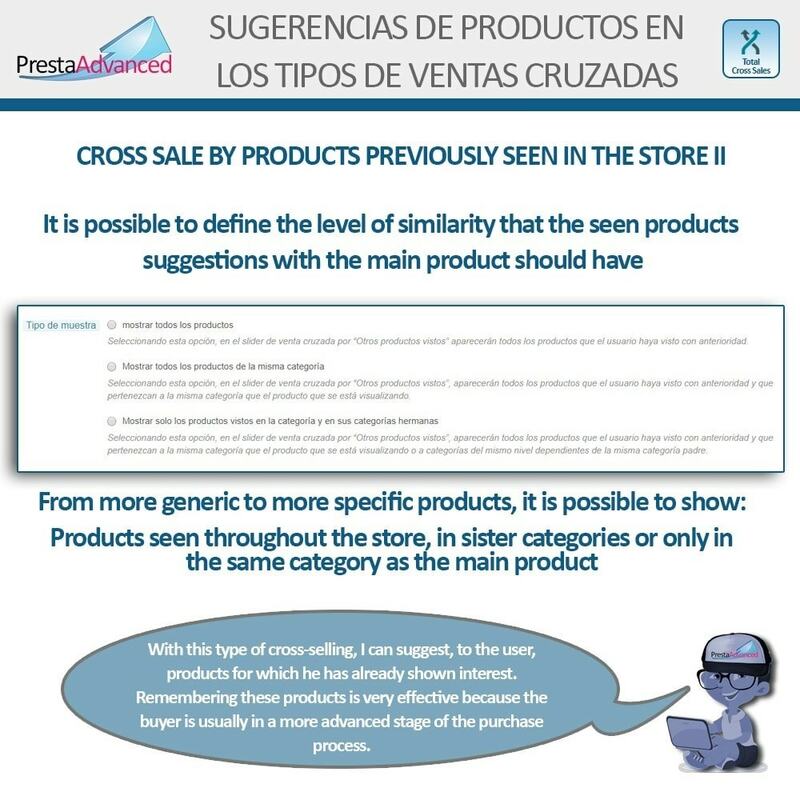 Cross selling by associated products. 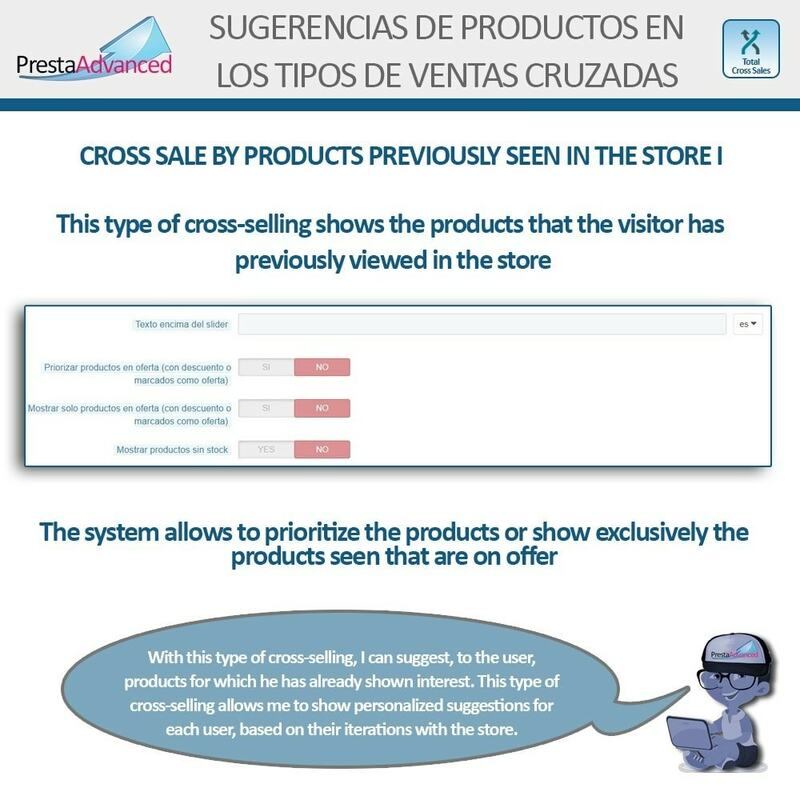 Cross selling by up selling products. 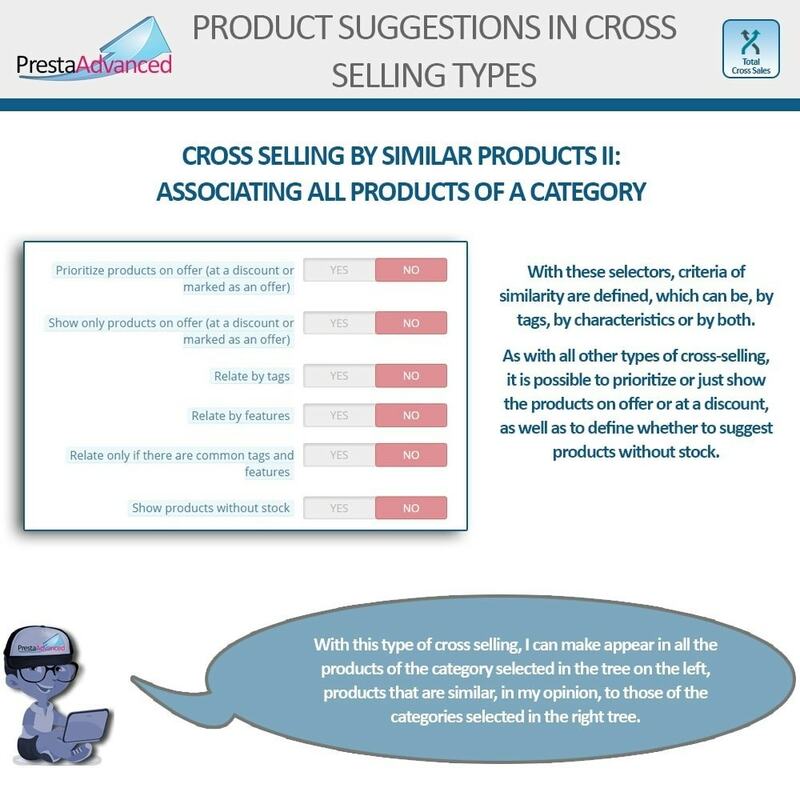 Cross selling by similar products (relation by tags, categories or both). 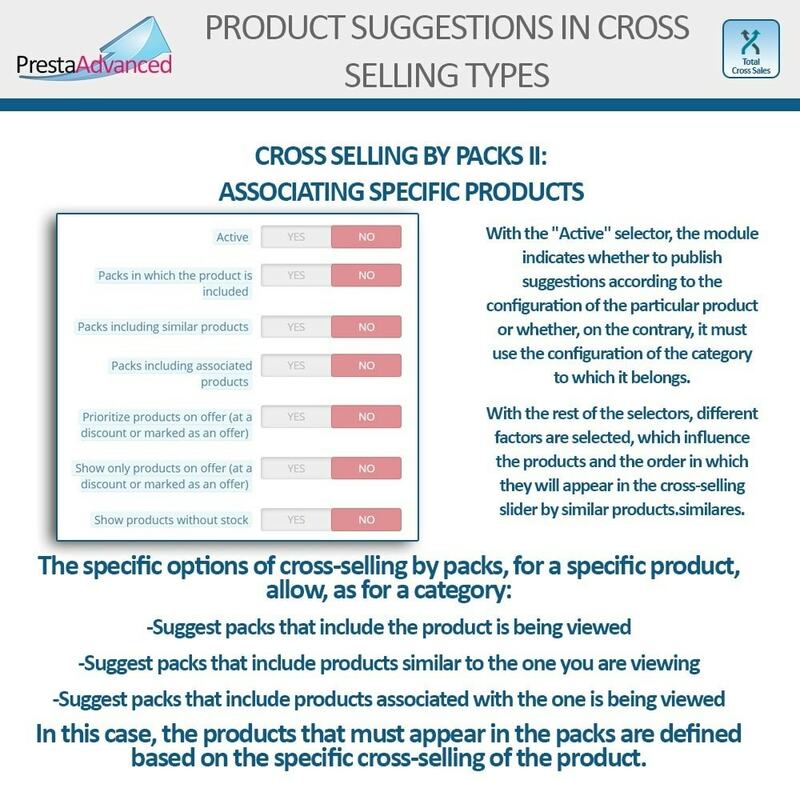 Cross selling by packs (that include the products or similar products). 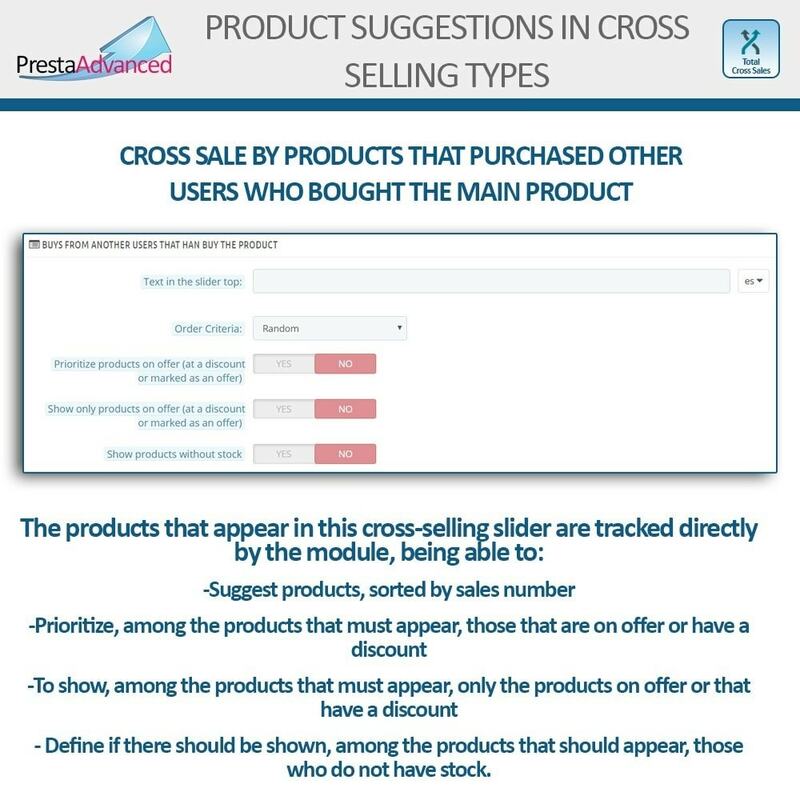 Cross selling by Purchases from other users who have bought the main product. 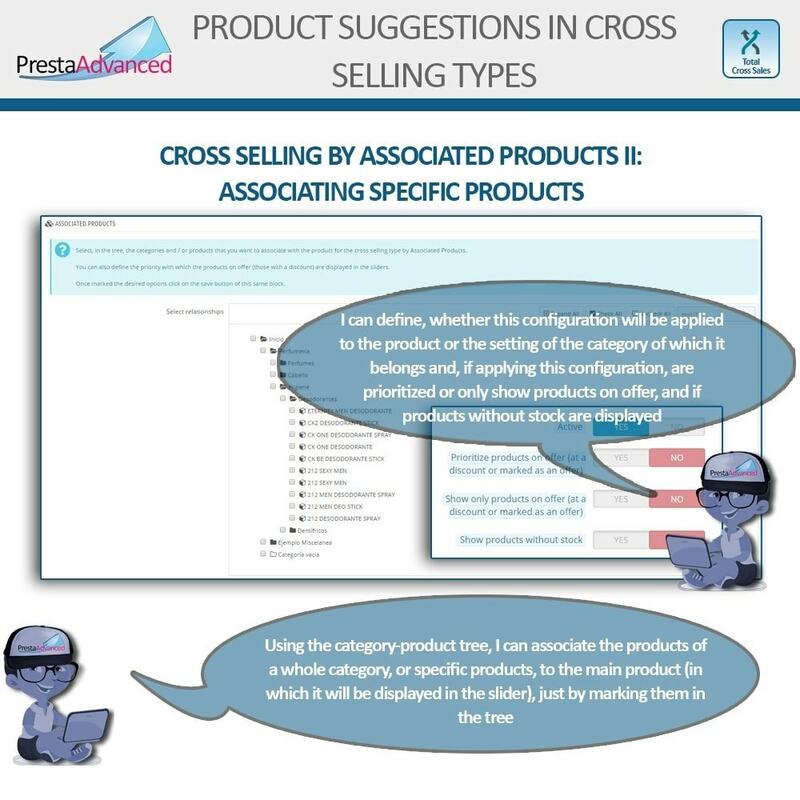 The possibility of establishing multiple structures allows the user to store different approaches to cross-selling, being able, by a single click, to activate any of these structures, becoming the Active structure. 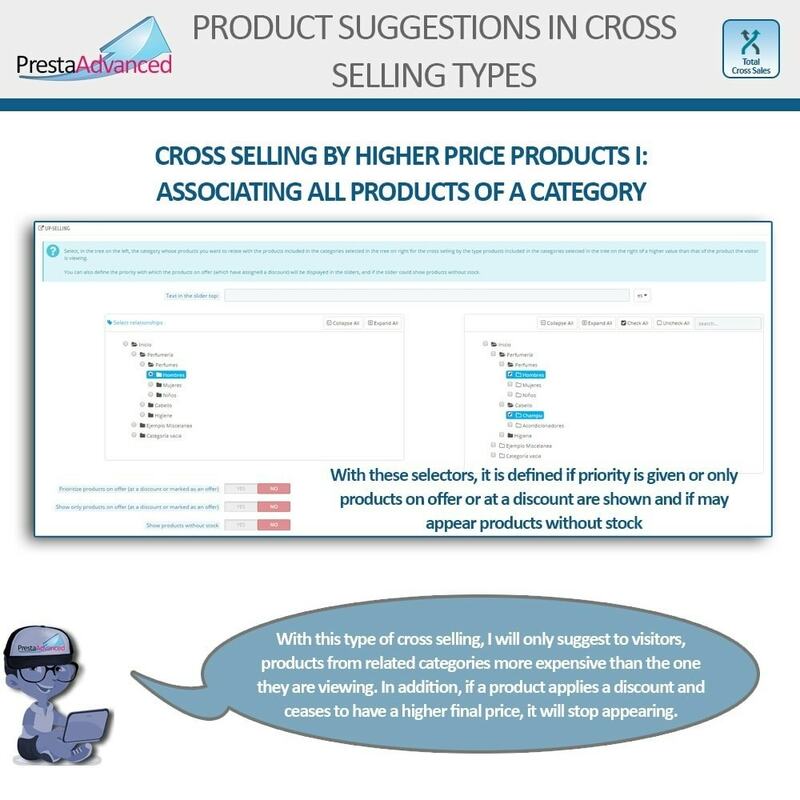 Itallows to get the most out of cross-selling, allowing increase the average amount of the shopping cart, using the different cross selling types. 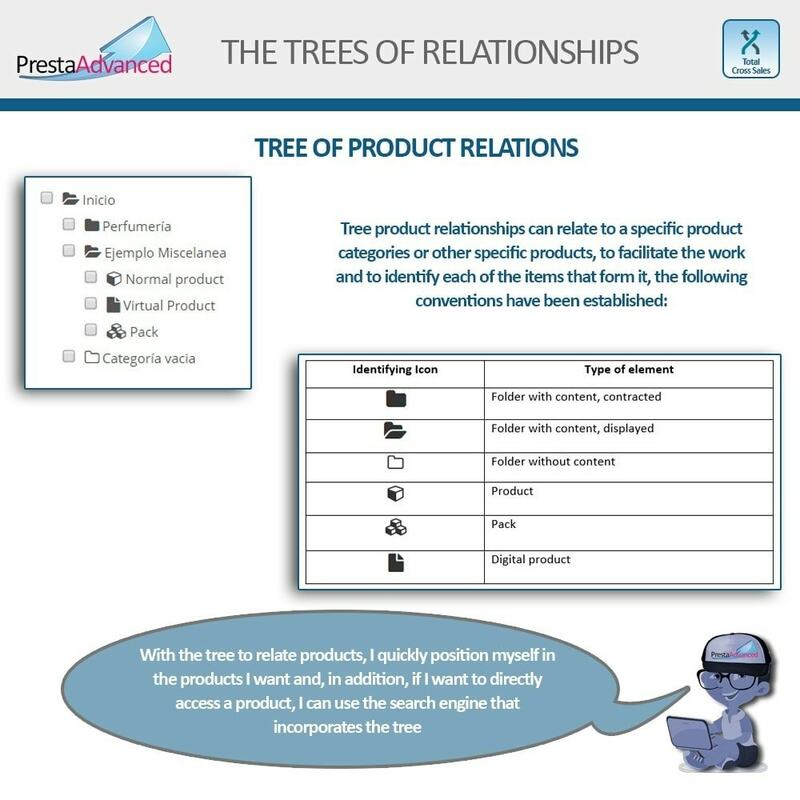 Relate products with the main product, at the level of the category to which the main product belongs or directly in the main product itself. 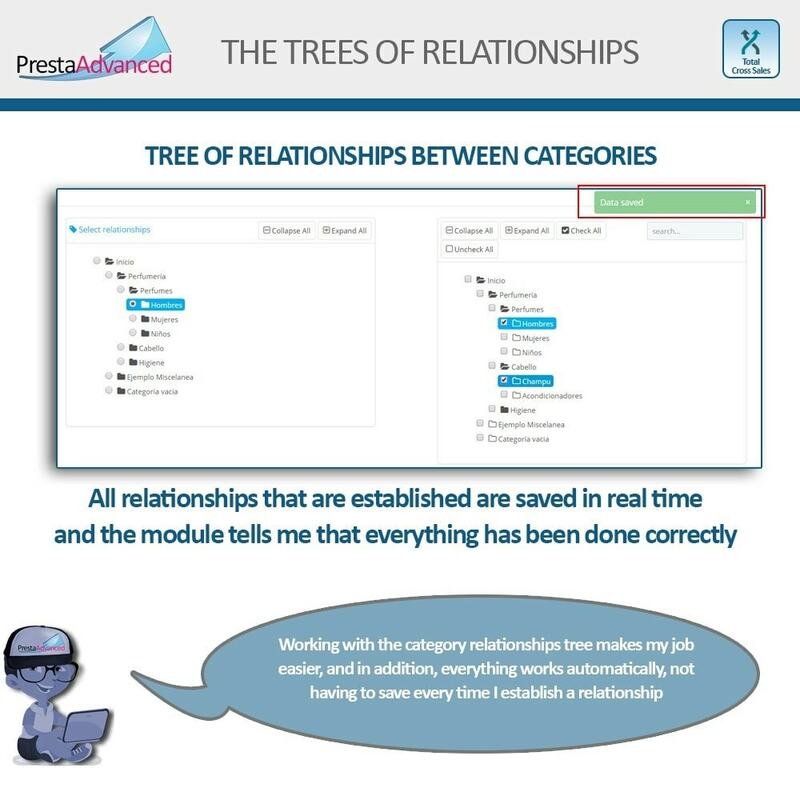 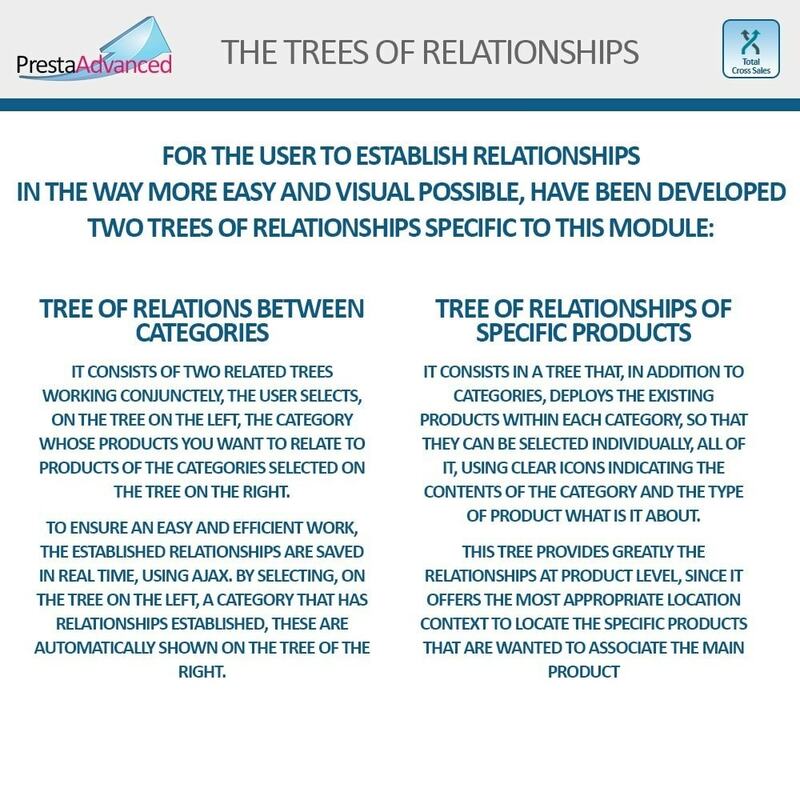 Establish product relationships with the main product in an easy and intuitive way, using linked trees of relationships between categories. 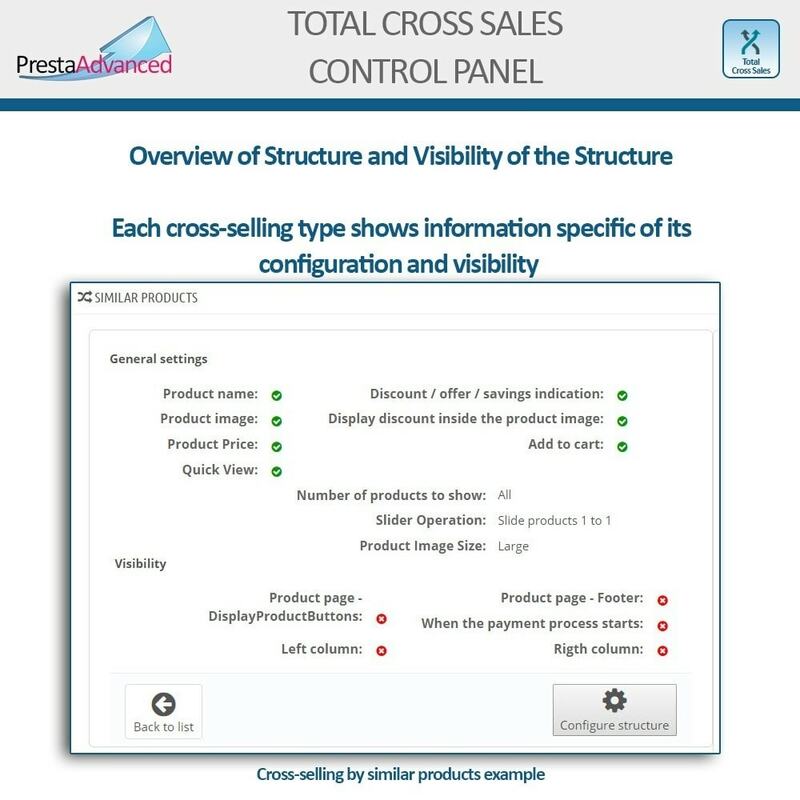 Manually select the products, at the main product level, using the categories – products tree in a totally visual way. 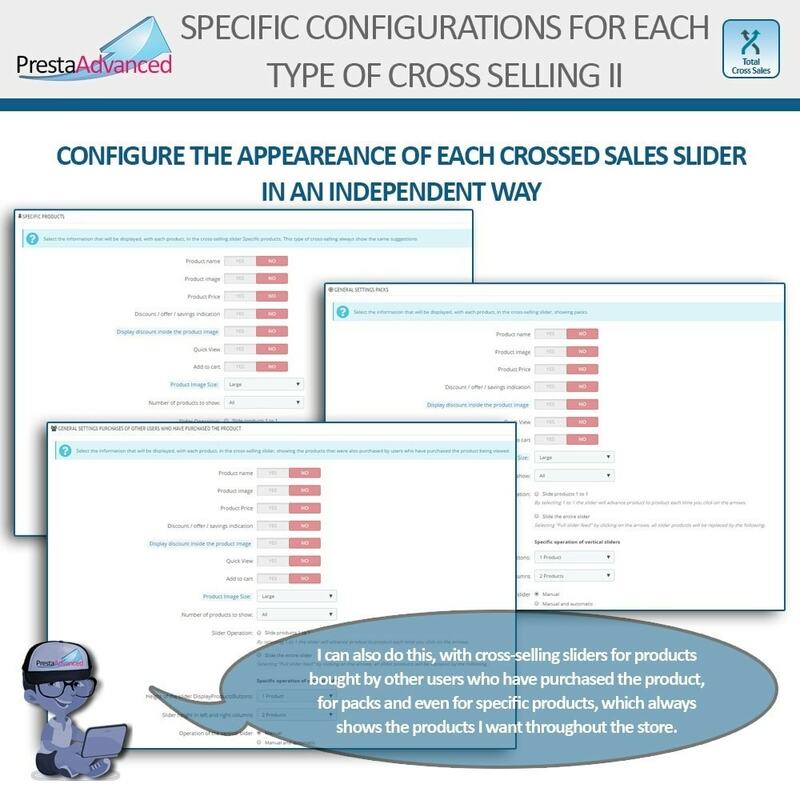 To know and to modify the configuration applied to each category. 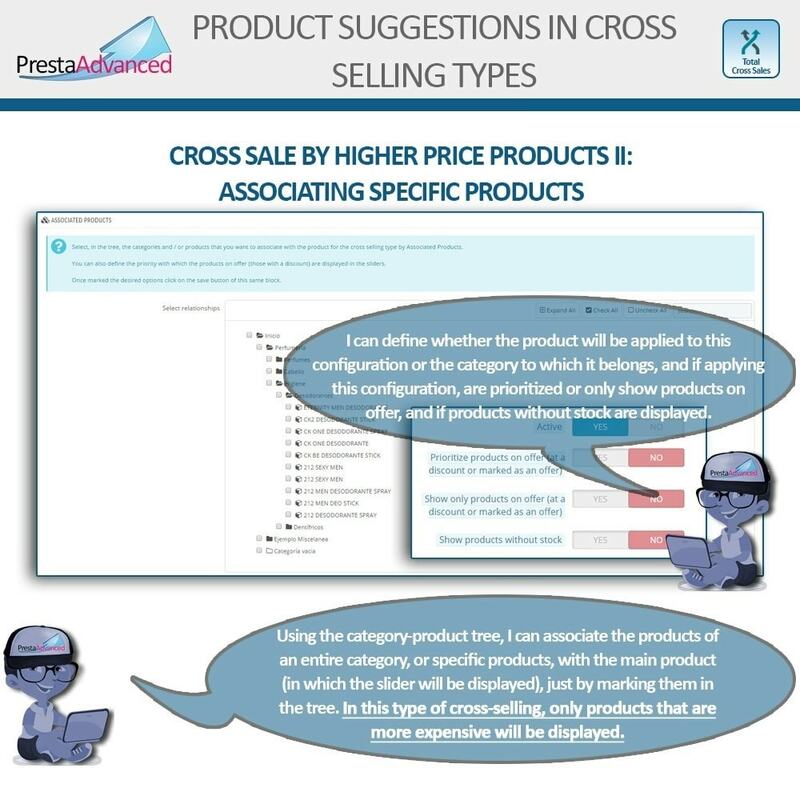 To know and to modify the relationships established at the category level for each type of cross-selling. 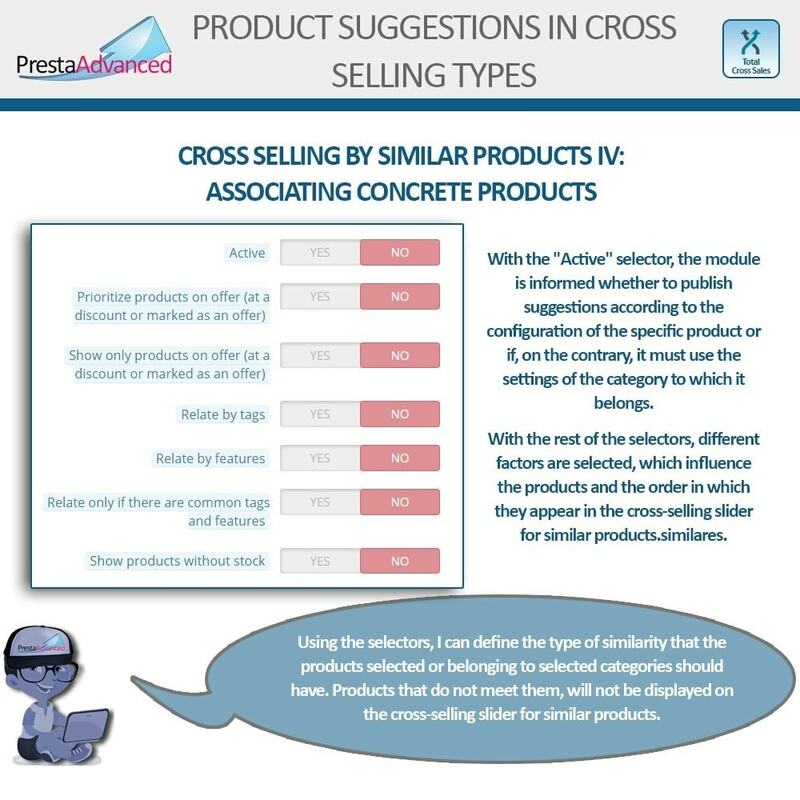 To know and to modify the specific configuration applied to each product. 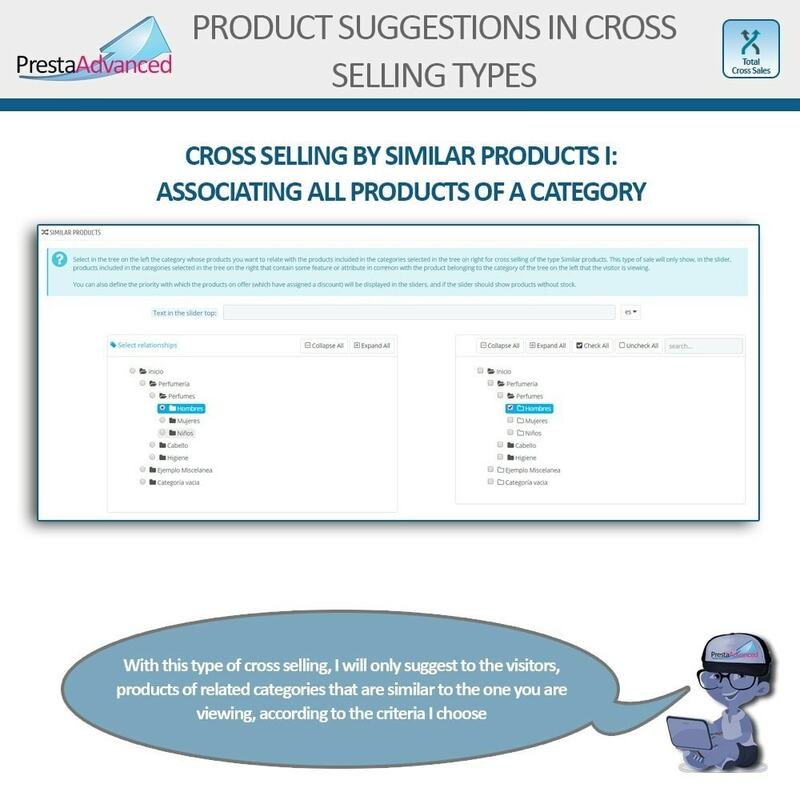 To know and to modify the specific relationships assigned to each product independently for each type of cross-selling. 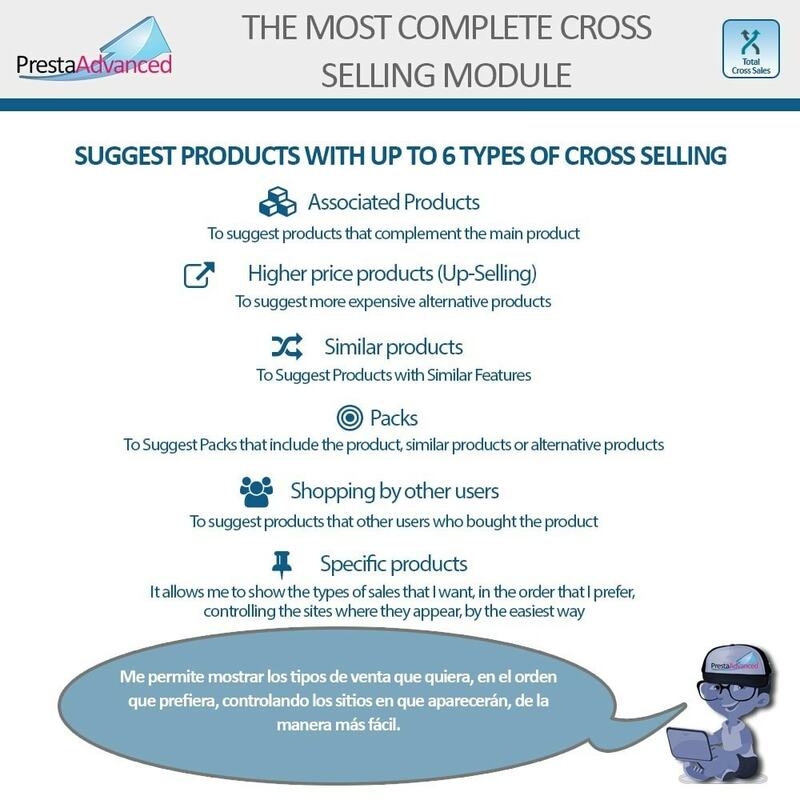 The possible use of up to 7 cross-selling types in their stores. 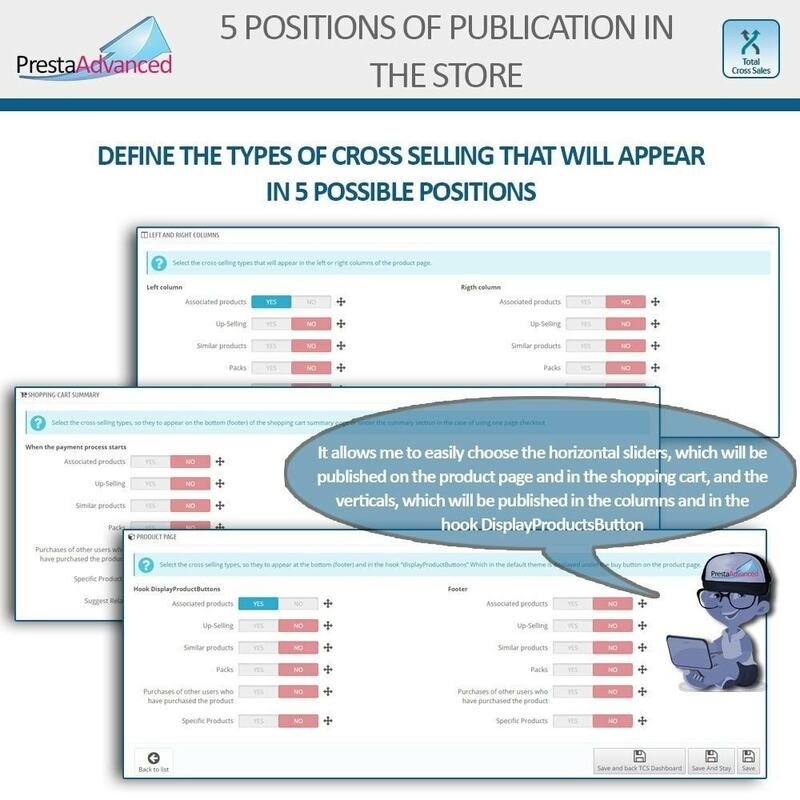 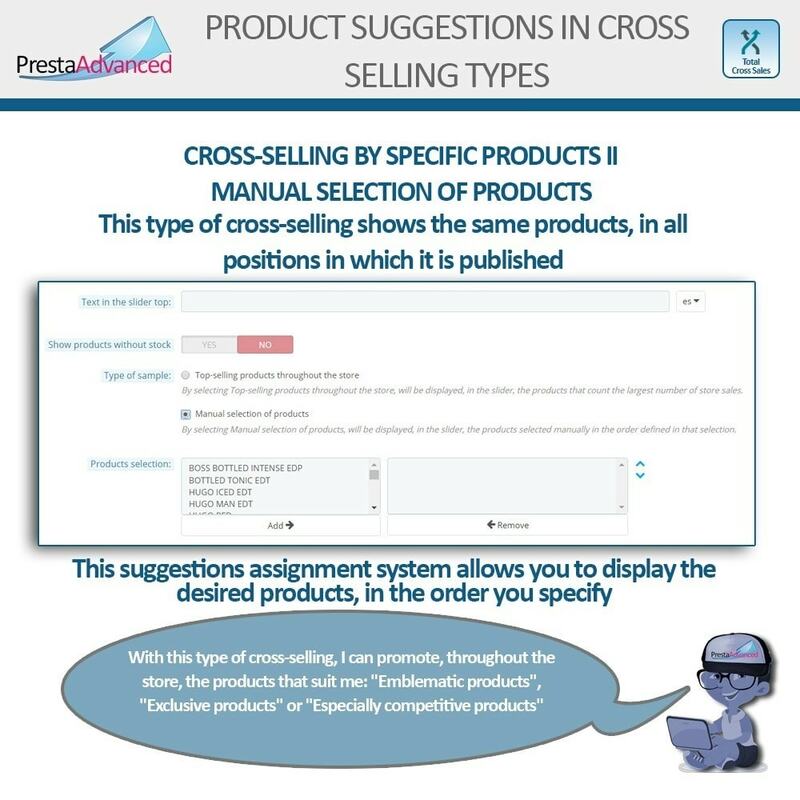 Define the order of appearance of the different cross-selling types on each page. 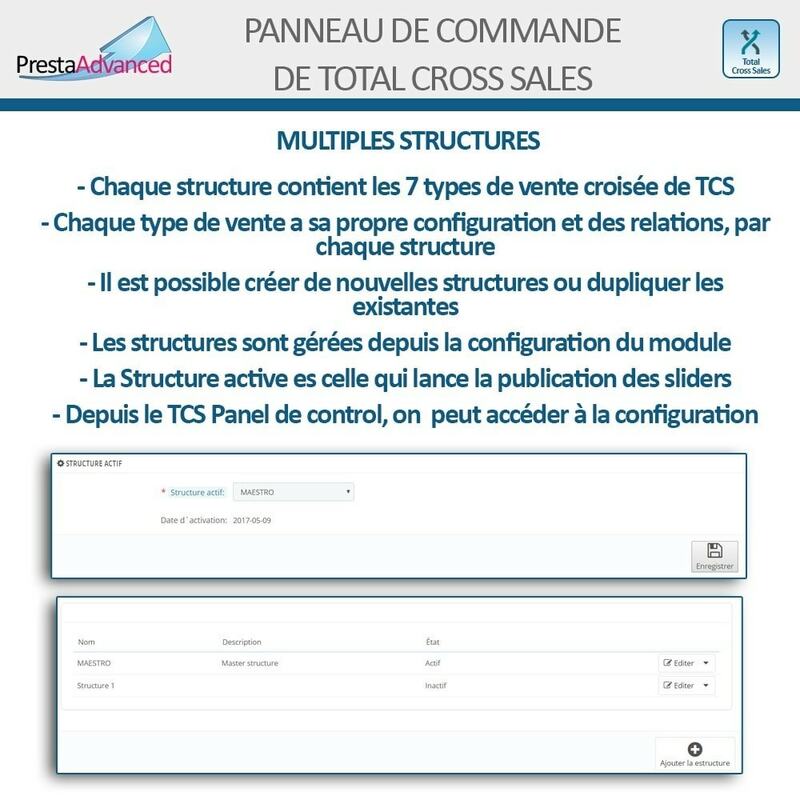 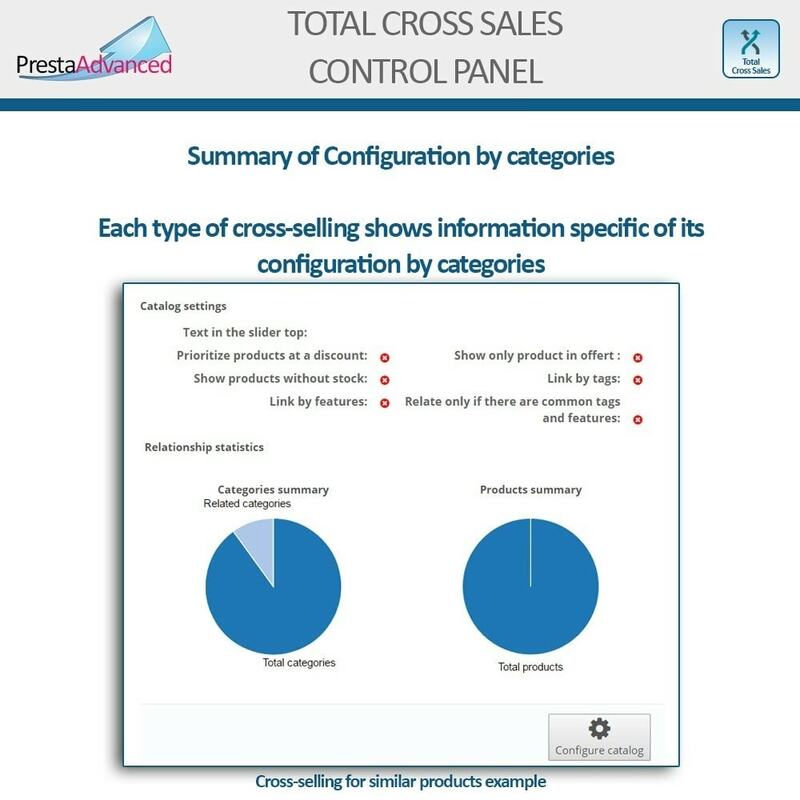 The configuration of multiple cross-selling structures, being able to use, in each of them, all the functionalities. 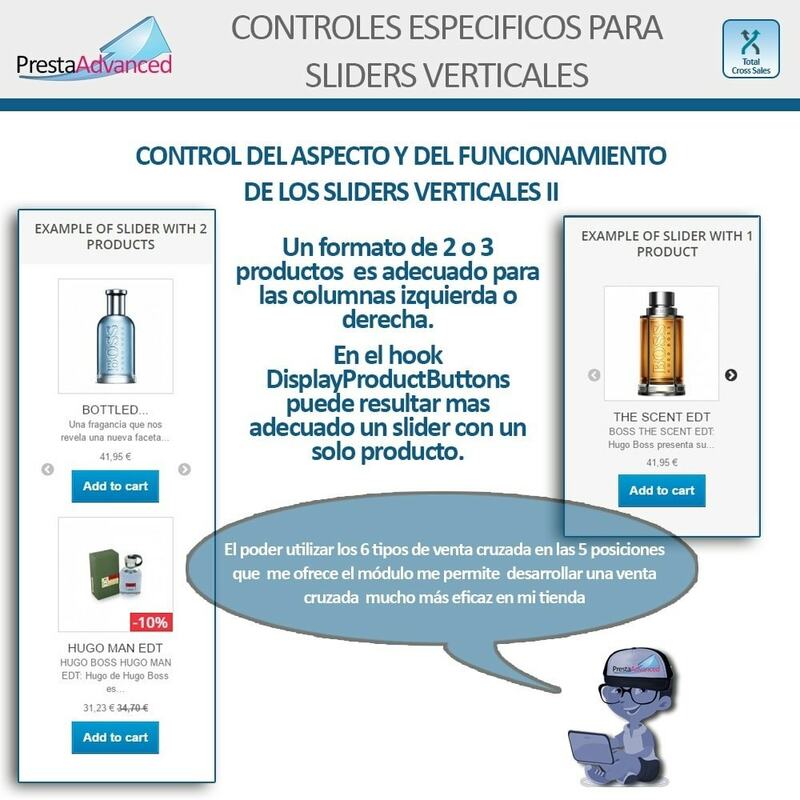 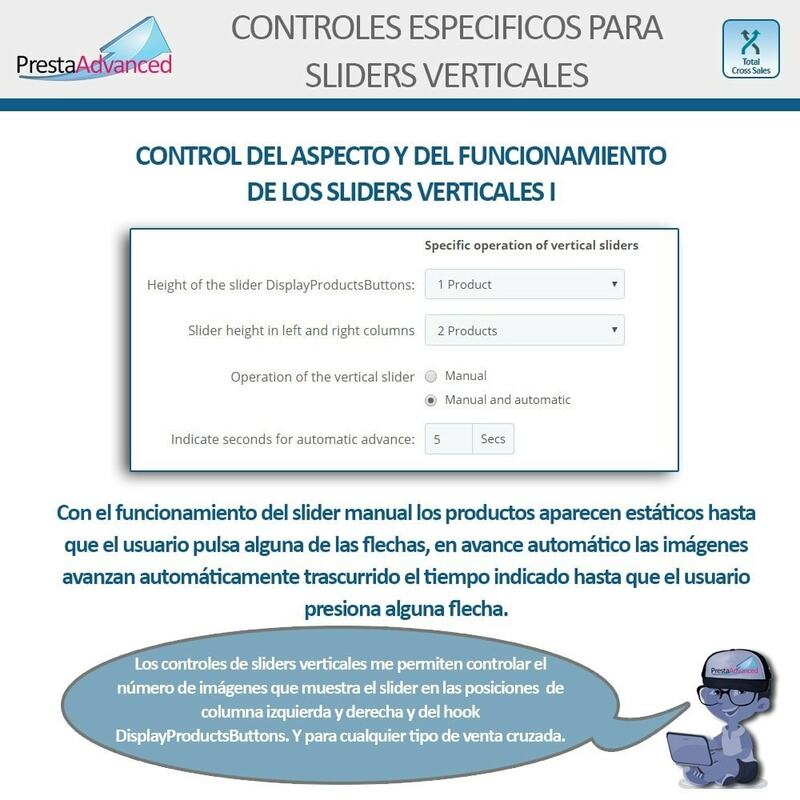 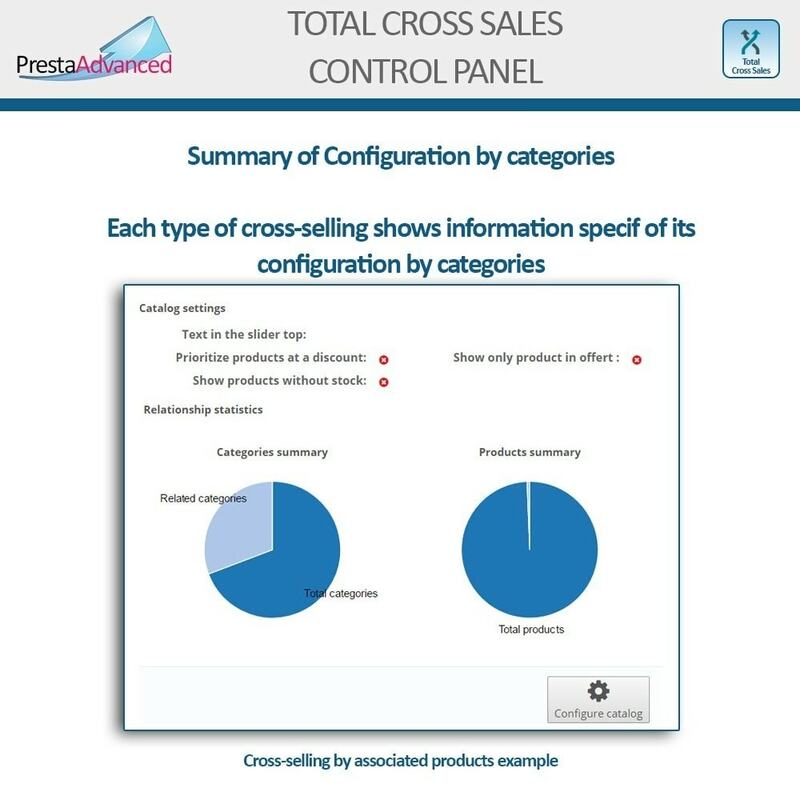 Control in each type of cross-selling of all the created structures, that allows to know, quickly, the active configurations for each product. 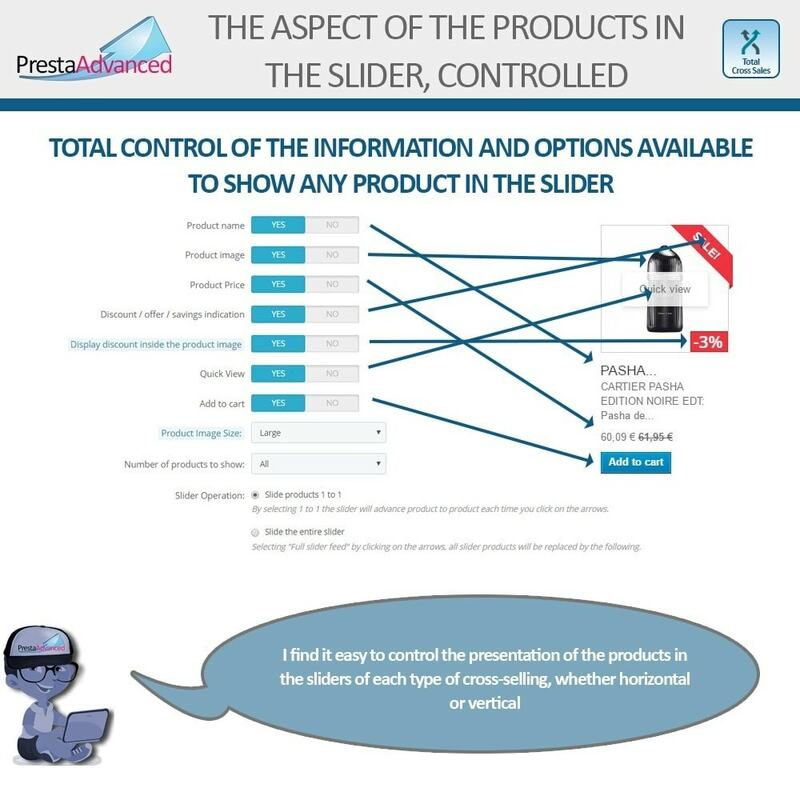 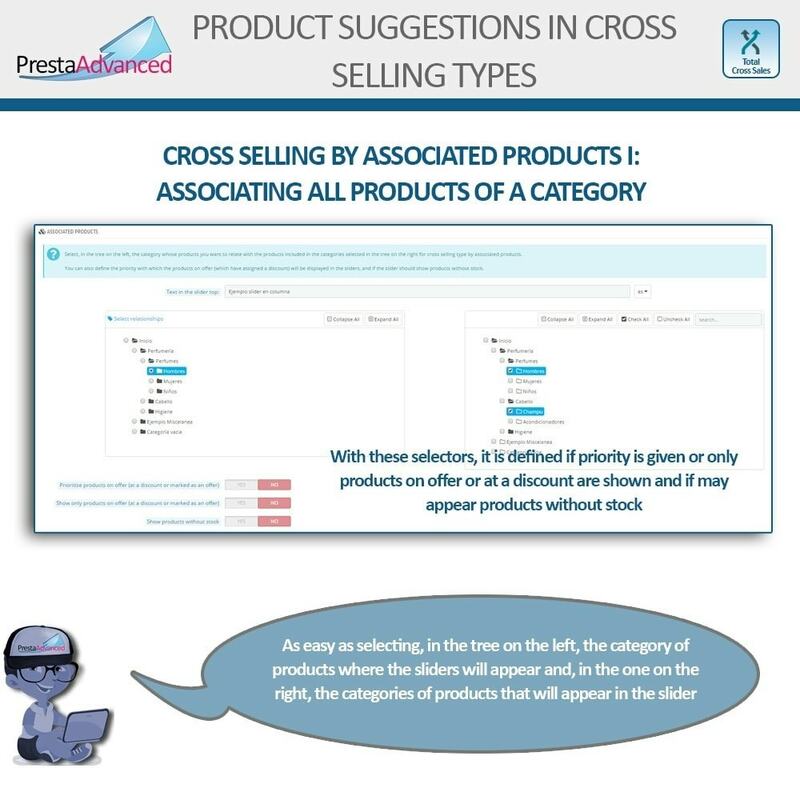 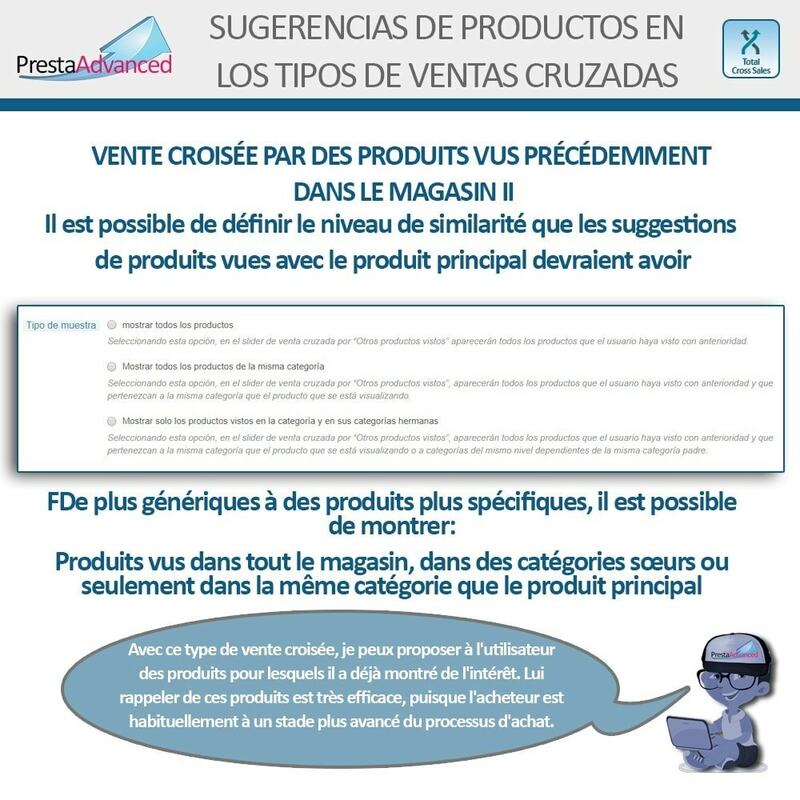 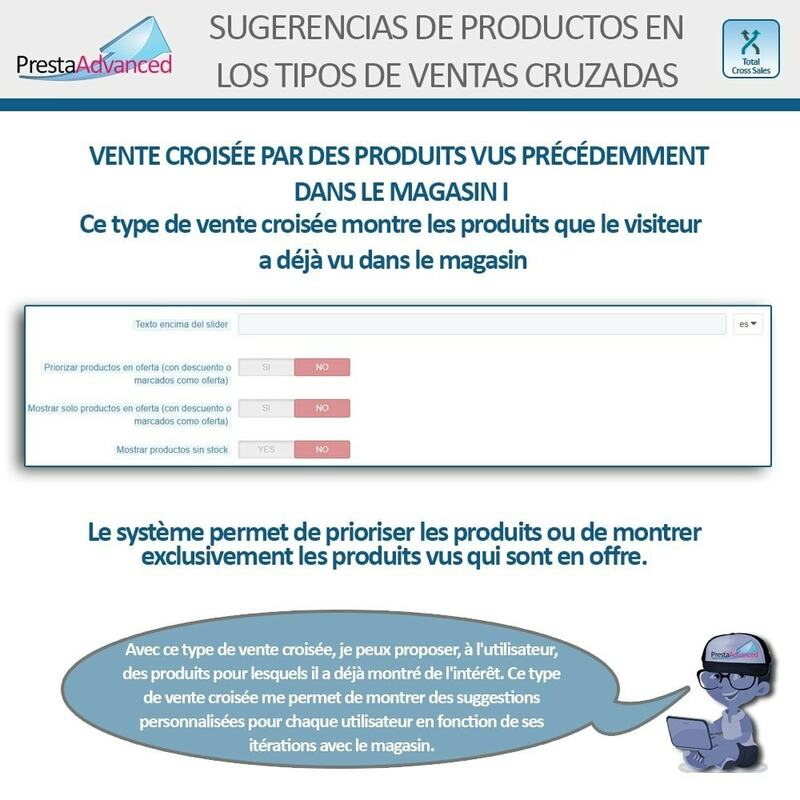 The creation of the list of products for cross-selling by associated products, at the category level and product level, in a visual and intuitive way. 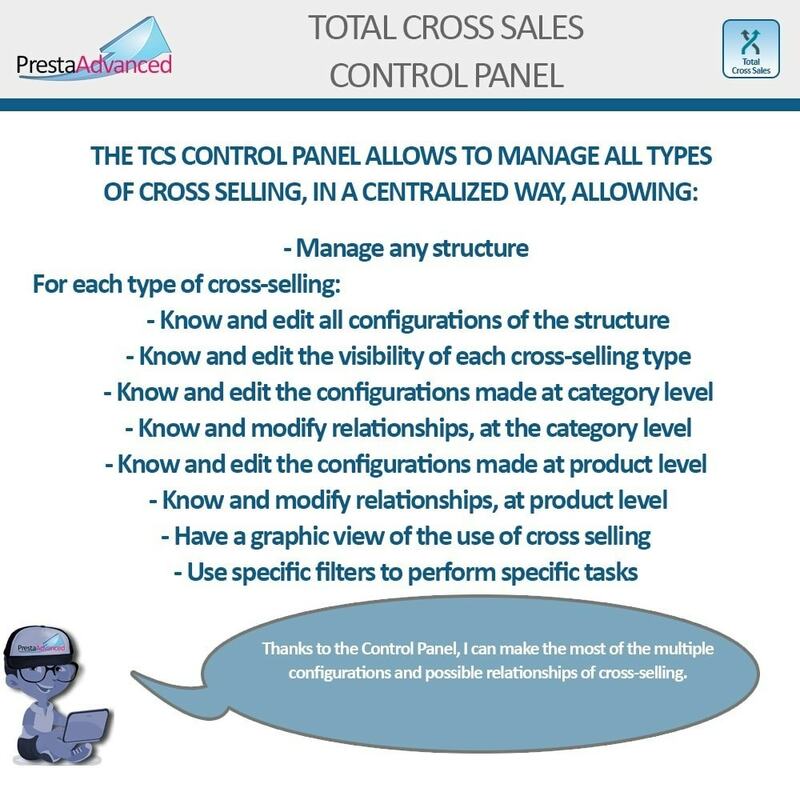 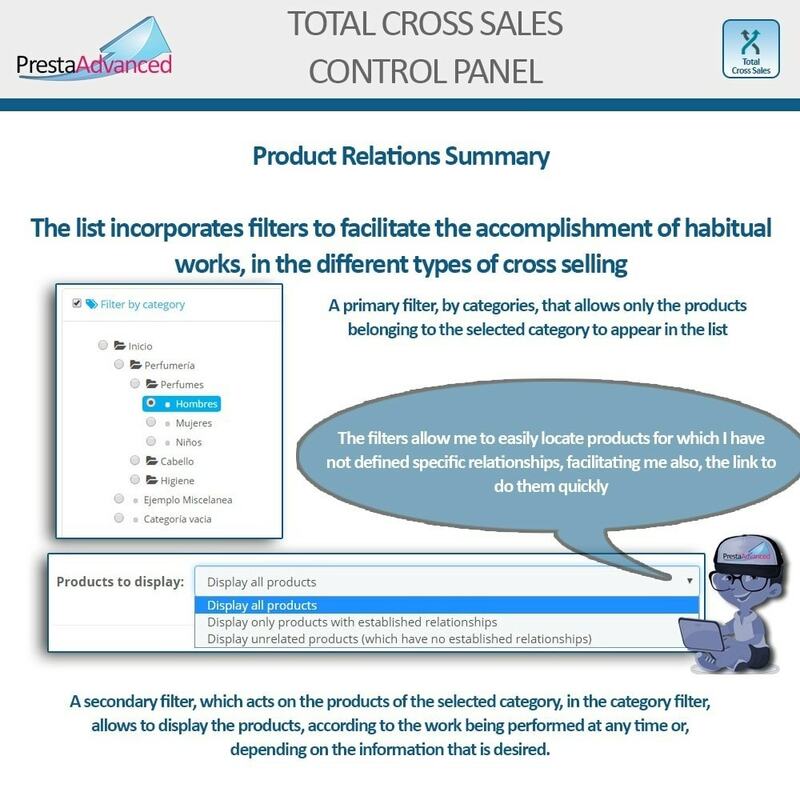 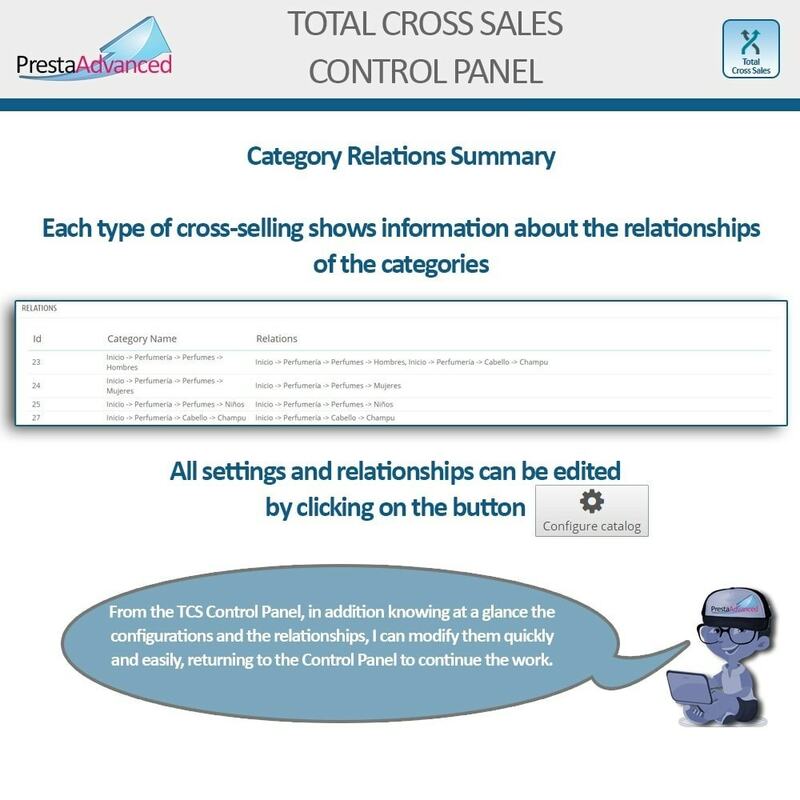 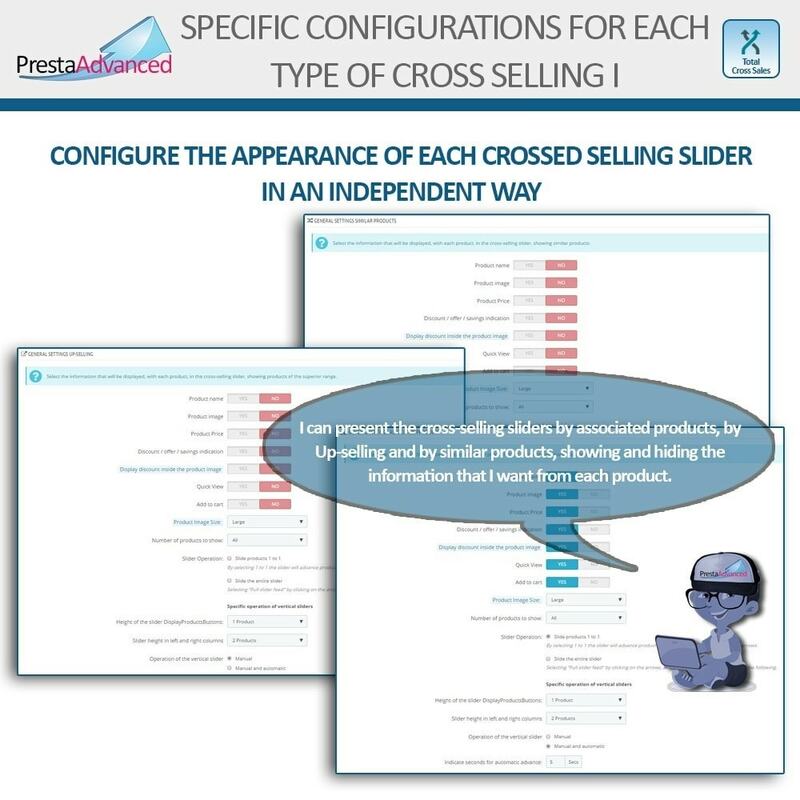 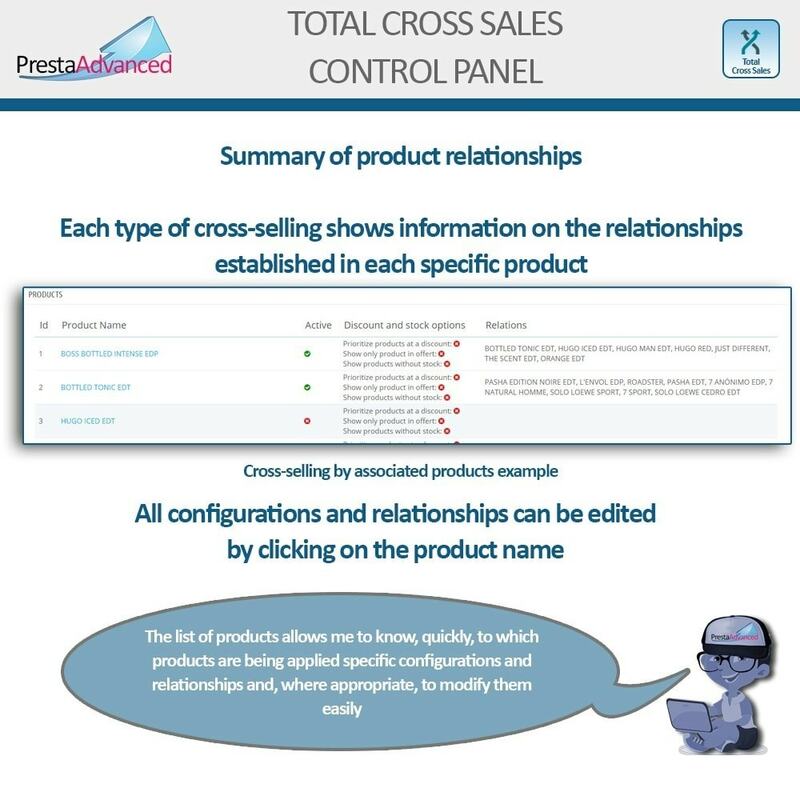 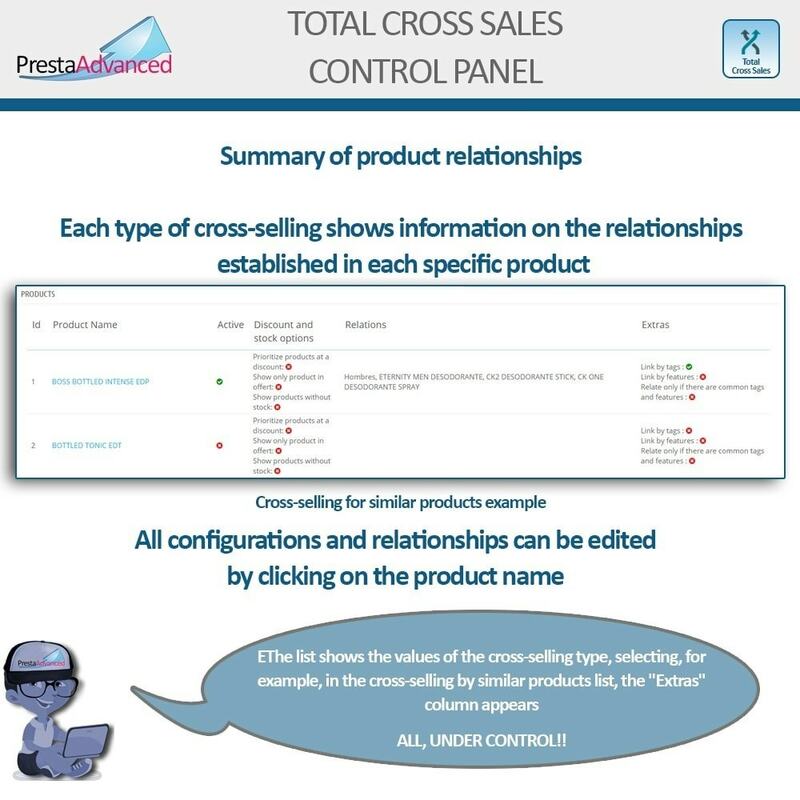 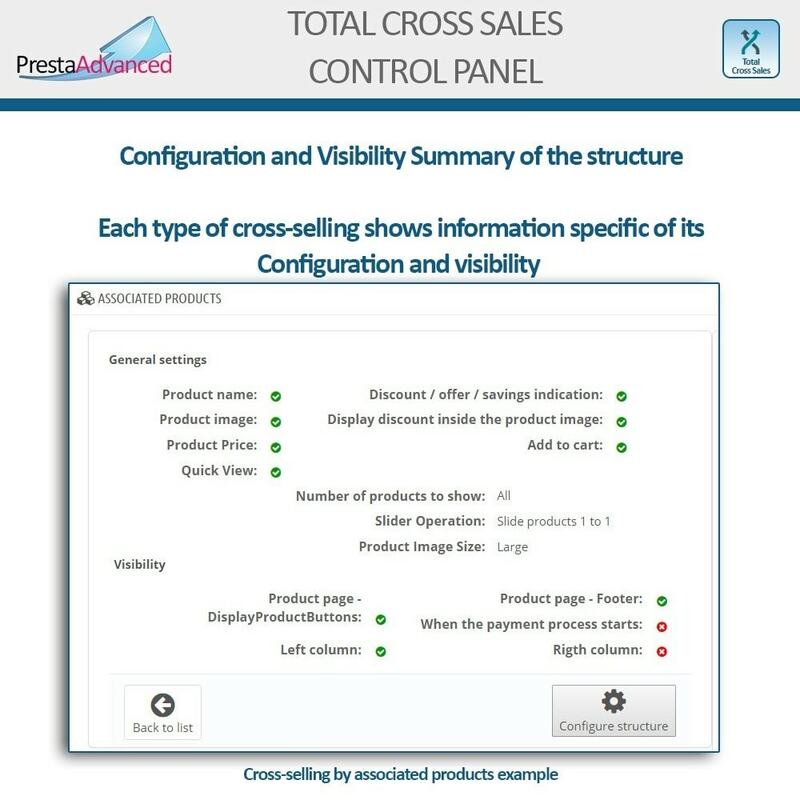 Maintain total control of the different structures of cross-selling, knowing at all times the type of relationship existing in each product for each type of cross-selling, through the use of the Total Cross Sales Control Panel. 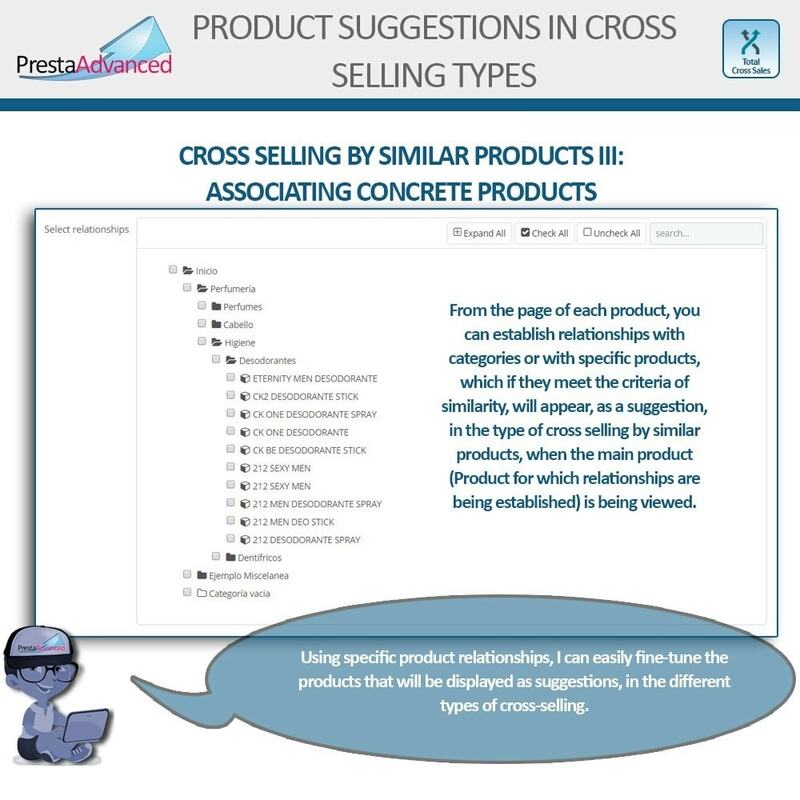 To know at all times by each type of cross-selling the existing relationships between categories and the specific relationships of each product, being able to filter by categories and by the state of cross-selling of the products, which provides a quick overview of the configuration and a quick edit to fit to the current criteria thanks to the direct edit links that are in the Total Cross Sales control Panel. 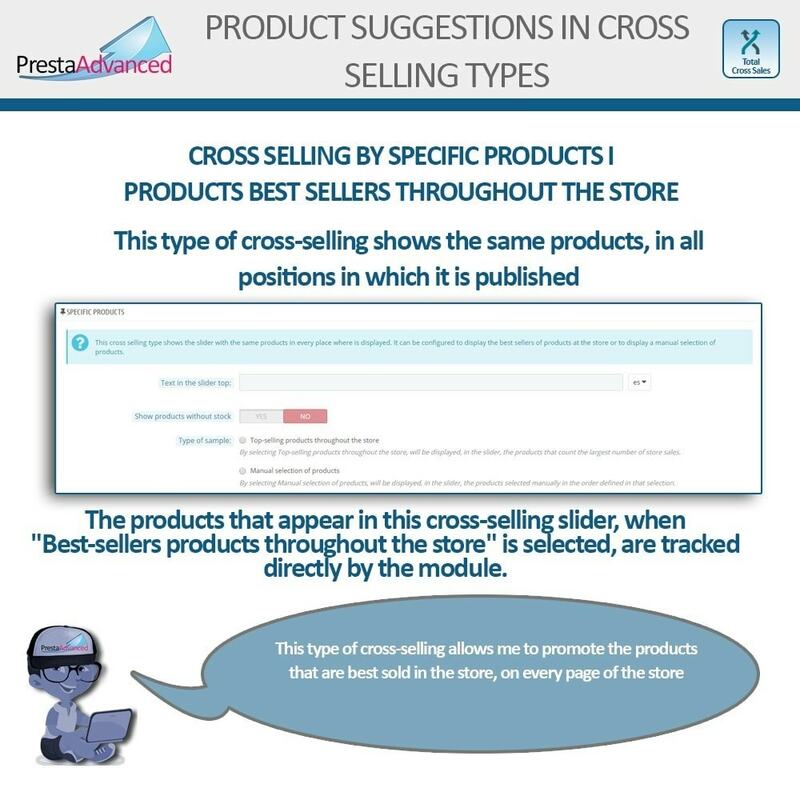 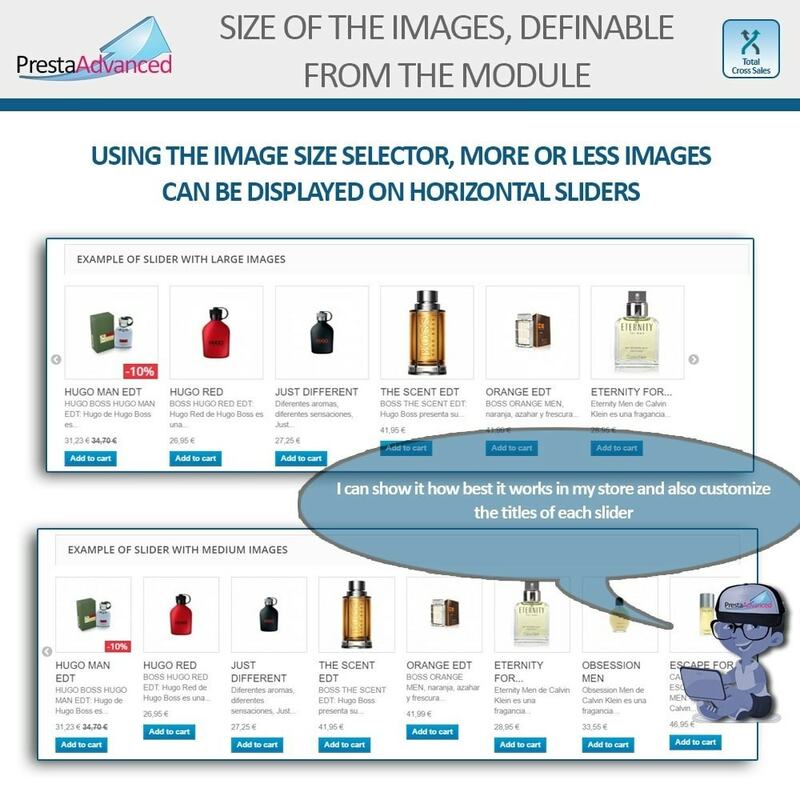 This module improves the customer experience in the store by suggesting products that he is most likely interested in, with consequent additional satisfaction. 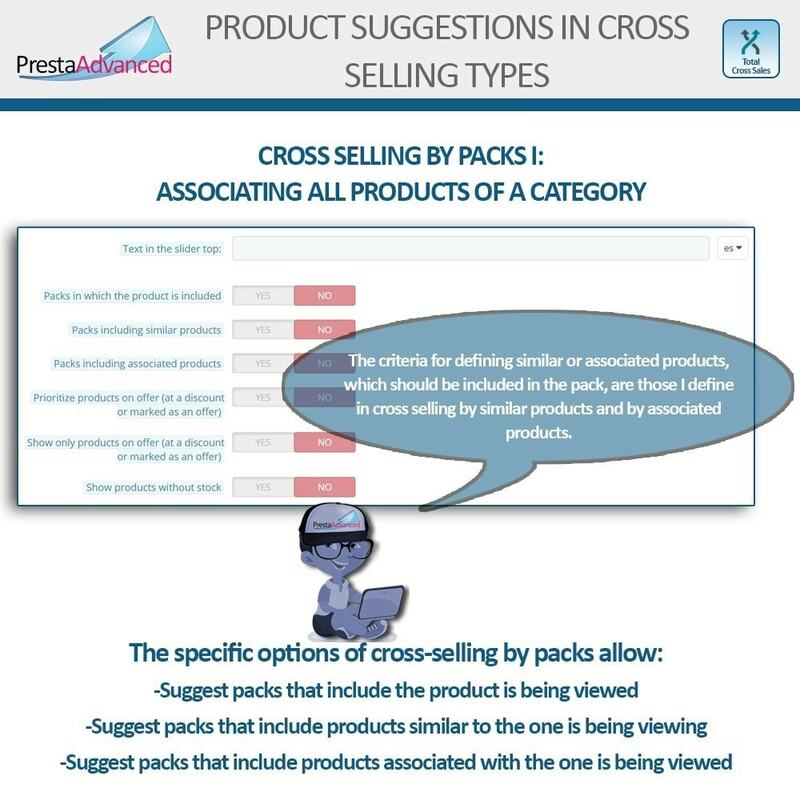 The type of cross-selling by products previously seen facilitates the user to be able to return to product pages already seen after visiting other products.